This is a very good addition to the climate change discussion. Illustrations and format give young readers a clear scientific understanding of what climate change means, how it affects animals and the natural world. At the end it gives a view of what humans are doing to try and solve it. The final couple of pages give a thumbprint of how we can help save polar bears, and a short description of the Arctic in trouble and a glossary. The book does focus on polar bears, but includes the other animals in their environment, too. I like this very clear and matter of fact way this has been written, with no doom and gloom shadows but with honest facts and nice illustrations featuring kids of all nations being involved in observations. 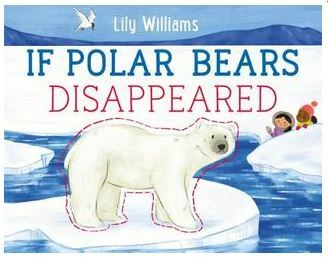 VERDICT: This is one of the best climate change books I have read so far for children. I tend to like science discussions that don’t emotionalize a subject but give facts and vocabulary palatable to the correct age range. I also appreciate the “what you can do” end of the book, because the subject could easily crash into negative conclusions. Kids will stay interested in this book and understand the subject much better overall. March 2019 review by Lynne Wright. Papineau, Lucie. Lucy and the Dragonfly. Illustrated by Caroline Hamel. Auzou, $16.95. ISBN 9782733856208. 33 pages. Ages 3-6. P6 Q5. Lucy and the Dragonfly is a story about a young girl who enjoys the nature playing outside. One day, drought and disease caused by climate change has killed the grass and dried the creek. The dragonfly she often plays with is so affected by the little girl’s misery that it takes it upon itself to find a solution for her plight. There are several issues with this book, both physical and plot-related. 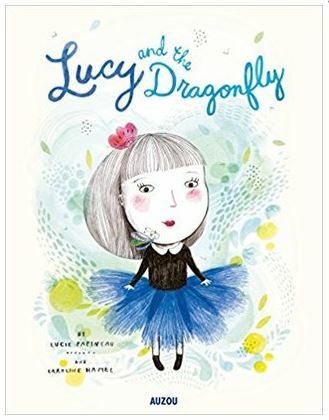 Lucy is white, lives in a house in temperate climate, and wears a tutu; yet, the dragonfly employs a boy living in an island village near the equator who needs to travel to the next village to use a phone. Of the two, who is going to experience the negative effects of climate change more dramatically? The story would have been exponentially more successful had Lucy initiated a global movement to help the boy and his village. The book has interesting and colorful illustrations; but the page numbering is a bit off or it is missing pages at the beginning. 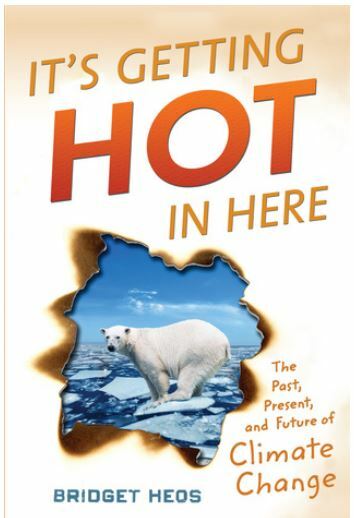 Verdict: I would not recommend this book, its messaging about climate change erroneously suggests that third-world countries have the responsibility to change their behavior before developed nations. The construction is poor, as well. Hirsch talks about some of the big concepts in climate change- the difference between weather and climate, the greenhouse effect, feedback loops, and carbon emissions. These ideas are laid out in a simple, well-organized way that will be helpful for young readers who are doing research for a report or class assignment.The book’s main focus is on the human consequences of climate change. 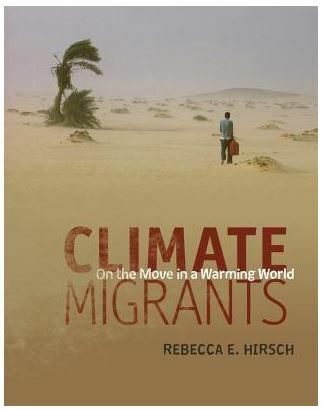 Hirsch looks at how weather change is bringing catastrophic changes to people all over the world, from hurricanes on the south coast of the US, to villages in Alaska and islands in the South Pacific that will soon be washed away by rising sea levels, to droughts in Africa and California. She talks about these crises and how people are being forced to move their homes to be safe, and often finding a place to go is very difficult. She says that by 2050, more than 25 million people will be on the move, trying to find a place to go. This subject is very pertinent today in Trump’s America- many of the refugees and immigrants coming to this country are being pushed by natural disasters and the associated poverty and sometimes violence in their countries to find a new home elsewhere. Hirsch offers some suggestions- climate change can’t be stopped, but it can be slowed and our planet and population can be protected from some of it’s more serious effects by taking action- using less energy, recycling, restoring desert areas into “green zones,” using non-fossil fuel sources, and implementing new technologies like carbon capture methods are discussed. The text is supported with photos, graphs and charts, and there is a table of contents, glossary, source notes, and bibliography. VERDICT: I think this book would be valuable in school and public libraries. It is a great source for students who are researching climate change and learning about the growing refugee situation around the world. March 2017 review by Carol Schramm. Climate change in the 21st century cannot be denied, and Heos explains its science and history. The beginning narrative describing the universe’s formation and periods of earth’s climate changes morphs into drastic shifts after people spent the global fossil fuels during the Agricultural and Industrial Revolutions. Full-color photographs depict effects of rising sea levels and changing weather patterns throughout the world. Beneficial are the “Be the Change” sections concluding each chapter, showing the readers simple ways in which they can make lifestyle changes to slow global warming. People of all ages should read this accessible, well-researched work on a issue that affects everyone lives. April 2016 review by Nel Ward. The modern artist and author of Earth Space Moon Base has composed a new expedition into another frontier: oceans. Readers join a few familiar faces to solve a maritime mystery. Price uses a compelling combination of alliteration, rhyme, and literalistic representations of sea life— rubber-nosed clown fish to gleaming sea stars— to subtly suggest the recent plight of starfish to children. The impressive illustrations are distinctly designed. Dramatized by black backgrounds, the eye-catching images keep readers’ attention as the heroes dive deeper into the dark. 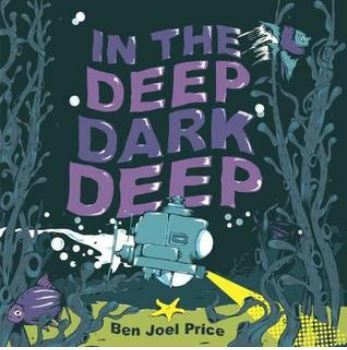 With In the Deep Dark Deep, Price has effectively attracted attention to a significant environmental anomaly by providing a whimsical primer for parents and educators teaching the impacts of climate change. December 2015 review by Lillian Curanzy.